This book kept popping up on my radar through book podcasts or on blogs that I regularly read. This told me I would probably like it. So, after purchasing a subscription to Audible due to a great deal, this book was my first purchase. I love nature and plants, even though I don't have the greenest thumb like my mom does. I still enjoy caring for my plants, trees, and flowers. I actually cried last summer when we had to cut down our beloved tree of 13 years. Thankfully, we have since planted a new one to replace it. Trees, plants, and flowers have always been a part of my life and I was hoping this book would stir up my love of plants and it did. Hope Jahren narrates her own book, sometimes with so much emotion, that I cried along with her. She went to college for literature, but her father was a scientist and had his own lab at the college. She was meant to have her own lab and through many toils and troubles and heartache, she did finally get her own lab. Her story is depressing at times and she admittedly has some issues with mental illness. But, her stories of becoming a mother and her research into a tiny seed and what she learned from it were emotional and fascinating. She is a slower narrator, so I listened at a faster speed which seemed to help me in the beginning. Pick this up if you love nature or personal stories of someone working hard to reach their goals. 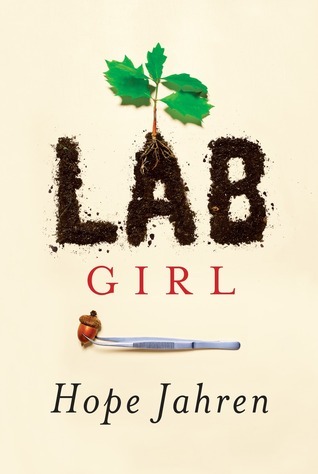 Sign into Goodreads to see if any of your friends have read Lab Girl.